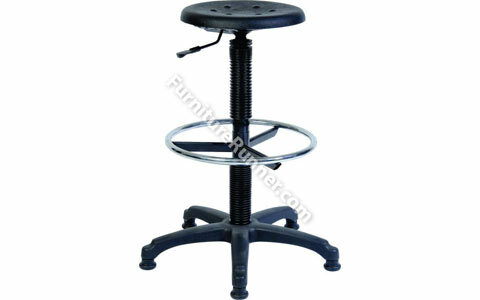 Draughting chair with gas seat height adjustment. Easy clean soft polyurethane seat. The ring kit is fixed, if you want it to be adjustable then see the Deluxe Version. • Draughting or counter work chair incorporating ring kit conversation • Gas lift seat height adjustment • Foot ring for off floor support • Easy clean soft polyurethane seat • Durable five star base with glides for stability • Requires easy self assembly.